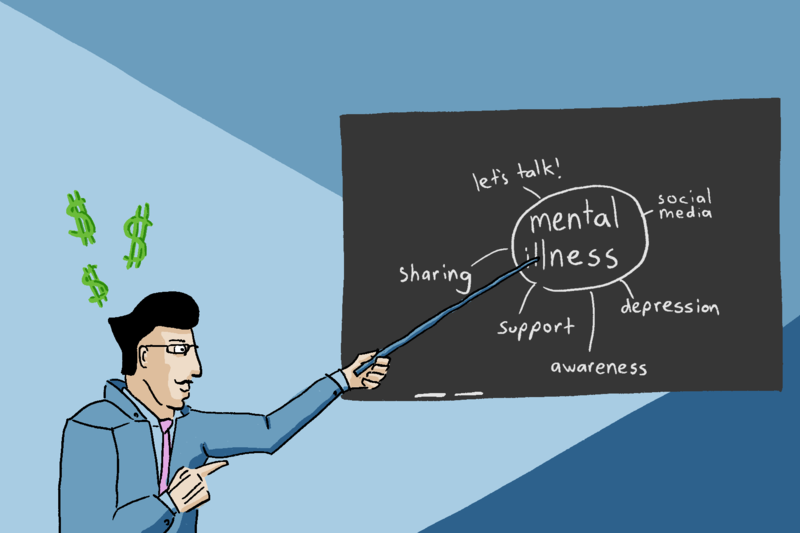 During the Bell Let’s Talk campaign, which took place a couple of weeks ago, social media sites were brimming with people sharing their experiences with mental illness in an attempt to raise awareness. For every tweet, Instagram post, Facebook videoview and Snapchat geofilter that mentioned the campaign, and for every call or text made by a Bell customer on Jan. 25, Bell donated five cents to various mental health resources. Millions of people supported the campaign, including celebrities like Ellen Degeneres, Ryan Reynolds and Prime Minister Justin Trudeau. According to an article by CTV News, the campaign raised $6.5 million this year, and more than $79 million total since its debut in 2010. This event is simultaneously one of the most effective mental health fundraisers and awareness campaigns in Canadian history, and also one of the greatest marketing strategies of all time. Bell was the number one company on everyone’s minds on the day of the event, and in a context of selfless philanthropy no less. It can be assumed, however, that selfless wasn’t entirely the case. The purpose of the campaign, in part, was undoubtedly to spread brand awareness, and thus grow financially. Is there a problem with the duality of this campaign? Does its success from a marketing perspective take away from its success in raising awareness for mental health issues? According to an article in The Globe And Mail, out of 1.2 million Canadian children affected by mental illness, only a quarter receive appropriate treatment. It is clear that there is a stigma around mental illness, because it is not being treated the same as a physical illness—such as a broken bone—to which Canada’s health care always provides adequate aid. In order to end this stigma, we need to be comfortable talking about it as a real illness, and we need some loud voices to start the conversation. In our society, corporations hold a lot of power and influence, thus they have some of the loudest voices. They are capable, then, of effecting real change and, as is the case with Bell Let’s Talk Day, that change can be extremely positive. My only problem with it is that the economic market that we live in runs on self-interest, and it is hard to see any corporate act outside of that context. For me, Bell crossed a line in using mental illness in the manipulative, profit-driven environment of the marketing world. Mental health is such a serious issue to people who have been affected by it. According to the Canadian Mental Health Association, one in five Canadians will experience mental illness at some point in their lifetime. I’m convinced that Bell saw an opportunity to capitalize on that fact, and that they don’t really have the interest of those with mental illnesses in mind. Hints of this emerged on the day of the campaign, when the CBC broke a story about a Bell Media employee who was fired after requesting time off—with a doctor’s note—to deal with their mental illness. Bell is still a profit-oriented company, and I think that to believe otherwise is not only false, but potentially dangerous. In my view, Bell is capitalizing on mental illness. They are profiting off of the pain of millions of people, which is immoral. Bell’s power as a major corporation makes them one of our best resources for fighting the stigma around mental illness. However, I don’t think that we should view this as a permanent way to deal with the problem of mental illness in our society. Once the conversation is more free and the stigma gone—or at least drastically decreased—the problem should be dealt with by more responsible institutions that solely have people’s best interests in mind—such as the government and not-for-profit organizations—rather than left in the hands of corporate companies that don’t. I propose that for now we view the Bell Let’s Talk campaign as a necessary evil, and as a stepping stone towards a society that deals with mental illness more effectively and morally.